Celebrating National Milk Day? Thank your genes! Happy National Milk Day! (Yes, really!) In honor of this udderly fantastic occasion, we wanted to explore the surprisingly close relationship that developed between dairy and human genetics. You’ve probably heard of natural selection, the process by which nature selects for the most reproductively fit organisms. Through this process, animals and plants alike gain advantages that help them pass their genetic code onto the future generations. Humans are no different—throughout history, we’ve accumulated (and continue to accumulate) small changes in our genetic code that give us selective advantages. Amazingly, milk is responsible for one of the most strongly selected genetic changes in the past 30,000 years!1 The ability to digest milk as adults is actually a relatively recent adaptation which may have provided a significant selective advantage to our ancestors. Why do we make lactase? Lactose is a complex sugar that is broken down by a protein in our intestines (known as lactase)3. Lactase helps us break down lactose into more simple sugars that can be absorbed into the body. Humans start making lactase during the 8th week of gestation and have peak concentrations of lactase at birth3. This allows infants to breakdown the lactose present in milk and use it as a nutritional source of calories! Believe it or not, at one time in history, milk was basically poisonous to adult human beings2. This is because milk contains high levels of a sugar known as lactose which, if the body can’t digest it, can cause diarrhea. For an ancient malnourished human being, this could be deadly. But today, approximately 35% of the world’s population is able to digest dairy products into adulthood and many of them have genetics to thank for that2. Evidence suggests that approximately 8,000 years ago, humans evolved the ability to digest milk as adults in multiple independent societies1. The development of this ability is believed to have been driven by an increased need for nutrients and the newly developed process of dairying (the practice of making and consuming dairy products from livestock). Societies that were present in northwestern Africa, northern Europe, and southeastern Asia all began domesticating livestock around this time period, which meant they had a nutrient-rich food source available to them if they could only digest it1,2. This provided an advantage whereby people who could digest lactose as adults were more likely to survive famines compared to other people in those regions. Under such pressure, changes in the human genome began to appear simultaneously in these different societies. Oftentimes, when a change to our DNA affects our physiological features, we might think they occur in protein coding regions of the genome. This is because changes to these regions of DNA can easily result in a nonfunctional protein, which can have significant effects on our biology. But interestingly, the changes that occured allowing some people to digest milk as adults are found in non-protein coding regions of the DNA. These changes are called single nucleotide polymorphisms (or SNPs for short) because only one base in the DNA sequence has been changed (the exact base changed varies depending on the population of people—the change in northern European societies is different from the northwestern African societies). This term describes a process where organisms not closely related to one another independently evolve similar traits. Several independent populations of ancient humans gained single nucleotide variants that allowed them to digest milk as adults. Research suggests that one common variant arose in a European population at least 5,000 years ago, while numerous other variants have been found which may have originated in separate African, Middle Eastern, and South Asian populations1,2. The SNPs that occurred in the DNA that allowed adults to consume lactose all occurred in the same area of the human genome. This area is surrounded by sequences of DNA that code for a gene known as MCM6. The MCM6 gene has nothing to do with lactose digestion, but is located very close to the LCT (lactase) gene. Scientists believe that this region in MCM6 is an important regulator of the LCT gene and may influence when the lactase protein is made. Although it’s not clear how these SNPs are able to affect lactase production, there is a clear association between the presence of certain SNPs in the MCM6 gene and the ability to digest lactose1. There are also many reasons3 people can’t digest milk that don’t relate to genetics; the types of bacteria colonizing your intestines may also influence lactose intolerance1, for example. 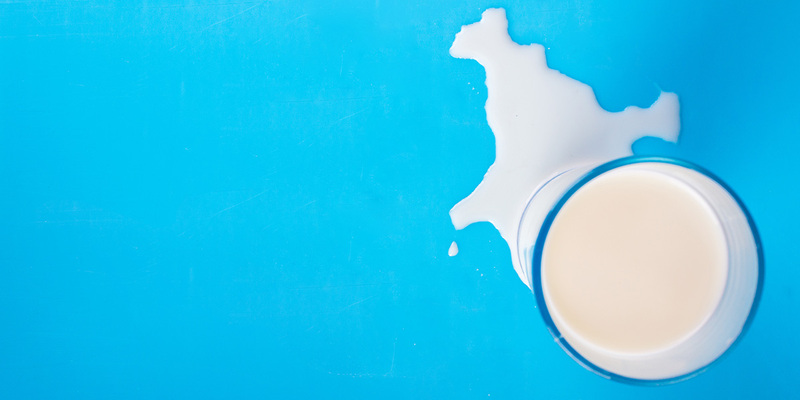 Because of this, lactose intolerance is not always obvious—some people may have subtle symptoms while others have severe reactions. One way to understand how your body may be processing lactose is to check your DNA using products in the Helix Store that assess the MCM6 gene, such as EverlyWell’s Food Sensitivity+, Insitome’s Metabolism, Dot One products like Personalized Socks, and DNAPassport by HumanCode. Don’t worry too much, though—if it turns out that you are lactose intolerant, there may be ways to mitigate the side effects. So on National Milk Day, go ahead: raise a glass (full of milk, obviously) to the cows, eat a piece of cheddar, and thank your genes! 1Gerbault, Pascale et al. “Evolution of Lactase Persistence: An Example of Human Niche Construction.” Philosophical Transactions of the Royal Society B: Biological Sciences 366.1566 (2011): 863–877. PMC. Web. 11 Jan. 2018. 2Curry, Andrew. “Archaeology: The milk revolution.” Nature, vol. 500, no. 7460, 2013, pp. 20–22., doi:10.1038/500020a. 3Deng, Yanyong et al. “Lactose Intolerance in Adults: Biological Mechanism and Dietary Management.” Nutrients 7.9 (2015): 8020–8035. PMC. Web. 11 Jan. 2018.